Tennessee is home to more than 60 higher education institutions, offering diverse two-year and four-year programs through two public university systems and numerous private colleges. Historically, the majority of the state's university programs have been research-based. However, Tennessee's many community colleges and private schools offer specialties spanning technology and liberal arts. Tennessee's colleges and universities are proud hosts of numerous champion sports teams; the state also houses a high concentration of theological seminaries, founded in the Christian tradition. With such variety, it may seem difficult to make a decision between renowned Tennessee institutions. 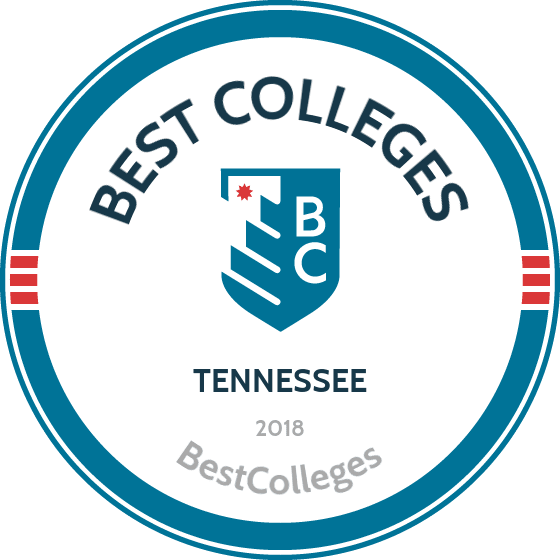 Fortunately, we have applied our rigorous methodology to the latest education data to rank the best colleges in Tennessee, including the top four-year and two-year schools. During the selection process, prospective college students in Tennessee compare location, affordability and the length of programs at postsecondary schools on their list. All postsecondary schools in Tennessee are governed by one of two entities, the University of Tennessee System or the Tennessee Board of Regents. Among the state's four-year flagship universities is the University of Tennessee, which operates a main campus in Knoxville, two additional campus locations and associated institutions specializing in health science and space science. The Tennessee Board of Regents is the governing body over large four-year institutions such as the University of Memphis, also a flagship university, as well as a large number of liberal arts schools and private colleges offering a variety of specializations. Four-year schools with the largest student enrollment tend to be concentrated in major city centers, including Nashville, Knoxville and Chattanooga. Tennesseans with a bachelor's degree earn a higher salary than those without a college degree. Graduates' salary after attending four-year institutions in Tennessee considerably exceeds the average national income, according to the U.S. Department of Education. A total of 68% of students who attended the University of Tennessee at Knoxville, for example, earned more than those in the state with only a high school diploma. To learn more about the potential career benefits of these and other four-year programs, browse our list of the top colleges in Tennessee. With top academic programs, Vanderbilt University is one of the best colleges in Tennessee. Undergraduate students choose from 70 different bachelor's degree programs, spanning biomedical engineering and education to music and foreign languages. Vanderbilt is very active in research and receives competitive funding from the National Institutes of Health. The school counts six Nobel Laureates among its alumni, including former vice president Al Gore. Vanderbilt is accredited by the Commission on Colleges of the Southern Association of Colleges and Schools. Students can participate in more than 500 student clubs, and there are ample opportunities for off-campus recreation and entertainment. With its location in Nashville, one of the most lauded music cities in the United States, it's easy for students to take advantage of the world famous music scene and nightlife. The campus, with 300 varieties of shrubs and bushes, is classified as an arboretum, and the oldest section, dating to 1859, is listed on the National Register of Historic Places. Founded in 1848, Rhodes College, one of the best colleges in Tennessee, is a private liberal arts college in Memphis. The beautiful, historic campus hosts a strong athletic program that includes 21 NCAA Division III teams. Students choose from more than 50 majors and minors and more than 100 clubs. More than 75% of students complete an internship, 80% participate in service learning, and more than half are members of a fraternity or sorority. Rhodes' undergraduate programs include an option that allows students to design their own majors or to pursue dual degrees in partnership with other universities in engineering, education, and nursing. The Foundations Curriculum, taken by all Rhodes students, focuses on helping students develop critical thinking skills. More than 400 courses meet the requirements for fulfilling the Foundations Curriculum. Through a partnership with Baptist Memorial Hospitals, this is the only school among Tennessee colleges with a curriculum that focuses solely on degrees in the health sciences. The general education courses also have healthcare at their cores in order to give underclassmen a sturdy foundation in and base knowledge of the science and math they need as they move through their degrees. Academic programs are organized into three departments -- nursing, allied health, and general education and health studies -- and students choose from one of 11 majors including: biomedical sciences, radiation therapy, and medical radiography. Baptist Memorial also offers a degree in pre-health studies for students who are not sure what type of career in the healthcare field they will pursue. In order to fulfill their mission of helping students grow on a professional, personal, and spiritual level, the school provides access to career and counseling services. It encourages students to get involved with groups and organizations on campus, including several honor societies, Pre-Meds Without Borders, Colleges Against Cancer, and Cultural Exchange Club. Bryan College is located in the foothills of the Smoky Mountains in Dayton, Tennessee. Bryan's official motto, by which faculty and students are expected to live their lives, is "Christ Above All." A private religious college guided by a Christian worldview, all classes open with prayer. Undergraduate students have 25 majors to choose from, including biology, Christian ministry, music, and several pre-professional programs. A bachelor's of arts in politics and government offers a human trafficking concentration designed to prepare students to work against this problem upon graduation. Like other respected colleges in Tennessee, Bryan is accredited by the Southern Association of Colleges and Schools Commission on Colleges. Single students under the age of 22 who are not living with their parents are required to live on campus. One third of incoming students were homeschooled. Bryan College provides students with a number of faith-based services and programs, as well as student groups and sports, to create a sense of community on campus. Lincoln Memorial University is a private liberal arts school located in Harrogate, Tennessee. The veterinary school is one of the top among Tennessee colleges. The 700-acre DeBusk Veterinary Teaching Center gives students hands-on experience working with animals. LMU is also home to a college of osteopathic medicine, a school of law, and a highly-regarded college prep school. The university's large selection of bachelor's degrees includes programs in nursing, art, criminology, special education, conservation biology, and creative writing. LMU's Abraham Lincoln Library and Museum holds collections related to Abraham Lincoln and the Civil War. The annual Mountain Heritage Literary Festival pays homage to LMU's rich literary past. With a focus on personal growth and community, and an average class size of 14, students can expect the individual attention that will lead to their success. Johnson University, located in Knoxville in the Smoky Mountain foothills and founded in 1893, has a strong Christian worldview. All academic programs include a biblical core designed to prepare students to be Christian leaders. Bachelor's degree programs are service-oriented, with majors like media ministry communication, children's ministry, intercultural studies, and nonprofit administration. Johnson's Urban Alliance partners with groups in Knoxville to provide educational experiences to urban youth, such as science camps, a scholarship program, and leadership development program. Many events throughout the school year focus on Christianity, including Preach Fest, Preaching Emphasis Week, and preaching workshops. The Johnson University campus has many unique features, including a recording studio for use by communications students. Johnson is one of the most affordable colleges in Tennessee, and there are more than 350 work study jobs available to students. Johnson has a strong athletics program, with teams for men's baseball, men's and women's basketball, cross country, golf, soccer, and tennis. Sewanee-The University of the South is a private, liberal arts college in Sewanee, Tennessee, located on 13,000 acres of the Cumberland Plateau, between Nashville and Chattanooga. Although it's unique among Tennessee colleges in that it's the only school in the United States owned by the Episcopal Church, Sewanee students come from all faith backgrounds. Sewanee has a long history steeped in southern traditions. The university's School of Theology has produced three of the last four Episcopal Church bishops. Notable Sewanee alumni include 26 Rhodes Scholars and dozens of Fulbright Scholars. Students choose from 36 majors, including international and global studies, neuroscience, forestry, and Spanish. An interdisciplinary program in medieval studies benefits from the annual Sewanee Medieval Colloquium, which draws medieval scholars from around the country. A large endowment makes it possible for many students to take paid summer internships, and 40% of students study abroad. Founded in 1915, Tennessee Technological University differentiates itself from other colleges in Tennessee by placing an emphasis on arming students with the skills necessary to compete in today's job market. TTU offers students a choice of 40 undergraduate degrees from six disciplines, including arts and sciences, business, and engineering. Students pursuing a bachelor's of science in wildlife and fisheries science can choose a concentration in conservation biology, fisheries science, or wildlife science. Other interesting undergraduate majors include environmental and sustainability studies, agriculture, and chemistry. Accredited by the Southern Association of Colleges and Schools Commission on Colleges, TTU also receives special professional accreditation for many specific academic programs. Founded in 1823, Union University, a private Evangelical liberal arts university, is one of the oldest and best colleges in Tennessee. Offering more than 100 Christ-centered programs of study, students can pursue their bachelor's degrees in Biblical studies, botany, digital media communications, and family studies. With a student to faculty ratio of 10:1, the focus is on student growth and success. All of Union's incoming freshmen receive financial aid of some type, making the university more affordable and accessible. The university's athletic teams are part of the NCAA Division II, and there are six sororities and fraternities. Students can join one of more than 60 student clubs including the College Democrats and the fellowship of Christian athletes. An annual speaker series called Union Forum brings notable figures from around the country to speak at the university. Founded in 1891 as Nashville Bible School, Lipscomb University is a private liberal arts Tennessee college with the primary goal of combining Christian faith with academics. Students can choose to pursue bachelor's degrees in 78 different undergraduate programs, including animation, art therapy, data science, and fashion design. Lipscomb also offers a number of majors focused on the Bible and Christianity, including worship ministry, theology and ministry, and vocational ministry. The Southern Association of Colleges and Schools Commission on Colleges accredits Lipscomb University to award bachelor's and master's degrees. Lipscomb views the city of Nashville and the greater world as an extension of its campus. Each year, the university sponsors mission trips around the world that are attended by students, faculty, and staff. Proud to boast a strong athletics program, Lipscomb counts 17 men's and women's teams that compete in the NCAA Division I, Atlantic Sun Competition. The University of Tennessee-Knoxville, one of the best colleges in Tennessee, was founded in 1794 and was one of the first public universities in the region. Undergraduate majors range from aerospace engineering and accounting to social work and plant sciences. Curriculum is designed to give students hands-on and practical experiences throughout their education. In 2015, an initiative was launched to increase experiential learning and give students more opportunities to help solve real world problems and became civically engaged by giving back to the community. Many notable people attended the University of Tennessee-Knoxville, including well-known politicians, educators, musicians, authors, and athletes. The university also boasts Rhodes Scholars, Pulitzer Prize winners, and Nobel laureates among its alumni. Tennessee's flagship university has been continuously accredited by the Southern Association of Colleges and Schools Commission on Colleges since 1897. One of the best colleges in Tennessee, Belmont University combines liberal arts and professional education with a Christian perspective. More than 7,000 students representing all 50 states attend Belmont, and they choose from more than 90 undergraduate programs. The College of Theology and Christian Ministry alone offers ten majors designed to prepare students for service, including worship leadership, ministry, faith and social justice, and Biblical languages. About half of the students enrolled in programs in the College of Theology and Christian Ministry continue their education, either in seminary or graduate school. Belmont University also has more than 160 student organizations, from fraternities and sororities to honor clubs and faith-based groups. Students who enjoy sports will be happy to learn that Belmont hosts 17 NCAA Division I athletic teams -- the Belmont Bruins -- including basketball, golf, tennis, and track & field. Aquinas College in Nashville is one of the best and most affordable Roman Catholic colleges in Tennessee. Founded in 1928 by the Dominican order, Aquinas is known for its focus on liberal arts and its small average class size; the school boasts a 7:1 student to faculty ratio. Aquinas offers at least a dozen undergraduate programs in the schools of business, nursing, education, and arts and sciences. Majors include theology, mathematics, marketing, and elementary education. A newly launched study abroad program sends students to a private campus owned by Aquinas College in Italy, 45 minutes north of Rome. Students enjoy numerous recreation opportunities on the 83-acre campus in Nashville, including intramural sports and annual activities like Fall Fest, a campus talent show, and a Trick-or-Treat kickball tournament. A Christ-centered liberal arts institution of higher learning, Milligan College offers more than 100 majors, minors, and concentrations through its five academic schools include. Milligan's strong bachelor's degree programs include business administration, exercise science, and teacher licensure. As part of Milligan's mission to spread the word of Christ, the school encourages students to engage in service projects and make the world a better place. Milligan has a strong campus residence life, with more than 70% of traditional students living on campus. Its location in the northeastern part of the state -- a beautiful natural landscape in Southern Appalachia -- makes Milligan ideally situated among colleges in Tennessee. Nearby recreational opportunities include hiking, boating, and white river rafting. There are over 40 student groups and organizations on campus that strive to create a sense of community at the college. Located about 30 miles from Nashville in the city of Lebanon, CU is a distinguished private college that serves around 1,900 students. The school offers bachelor’s and master’s degrees in the humanities, education, arts, science, business, technology, nursing, and health professions. Some of CU's less common programs include athletic training, American studies, art and design, and sport and exercise science. CU is a participant in the Tennessee Promise program, which allows undergraduates to earn a two-year associate degree tuition-free before transferring seamlessly into a bachelor's program. As one of the most prestigious colleges in Tennessee, CU boasts a vast network of successful alumni, including politicians, academics, and artists. Some of the school's most notable graduates include U.S. Secretary of State and Nobel Prize winner Cordell Hull, influential political scientist John Burgess, and Tennessee Governor Frank G. Clement. One of the most respected Tennessee colleges, The University of Tennessee-Martin is part of Tennessee's flagship university system that was established in 1927 and is located in Martin, Tennessee. Students can choose from among 17 bachelor's degrees, including geoscience, mathematics, and natural resources management. Many of the programs offer concentrations, allowing students to focus their degrees, or they may decide to pursue a pursue an interdisciplinary studies degree. This program allows students to create their own programs, taking classes that help them reach their career goals. The UTM athletics program, which is a member of the Ohio Valley Conference and the NCAA Division I, includes 15 different sports for men and women, including basketball, track, rodeo, and rifle. Students have the opportunity to join one of the many clubs and organizations on campus, including 48 academic clubs, 15 honor societies, and 12 special interest groups. Notable UTM alumni include attorney and CNN host Van Jones, as well as several athletes and politicians. The University of Memphis was founded in 1912 as West Tennessee State Normal School. Today, more than 20,000 students attend the university, which is accredited by the Southern Association of Colleges and Schools Commission on Colleges. Students have a number of bachelor's degrees -- including anthropology, military science, business economics, and aerospace studies -- to choose from. Located in Memphis, U of M stands out from other Tennessee colleges because of its unique institutes and programs. The university's campus boasts the FedEx Institute of Technology and the Kemmons Wilson School of Hospitality and Resort Management, as well as the Center for Earthquake Research and Information and the Institute of Egyptian Art and Archeology. Two world-famous Egyptologists are faculty members at U of M: Dr. Peter J. Brand and Dr. Lorelei H. Corcoran. The Regents Online Degree Program allows students to complete degrees online, while a robust honors program creates a small liberal arts college within the larger U of M system. Trevecca Nazarene University, one of the best colleges in Tennessee, was founded in 1901 as a religious training school. Now a fully accredited private university in Nashville, Tennessee, Trevecca's mission is to provide a Christian education that creates future leaders to serve the Church of Nazarene. The university encourages students to get involved with their community, both on campus and around them, and provides a number of opportunities for everyone to make connections. Trevecca's academic offerings include 84 bachelor's degree programs, 19 master's degree programs, and 15 associate degree programs. Doctorate degrees and certificate programs are also available. E-commerce, interpersonal communication, personal training, and social justice are some of Trevecca's more unique undergraduate majors. The bachelor's of science in social justice is an interdisciplinary degree designed to prepare students to serve the world using a framework of Christian ethics and human rights. Students majoring in social justice have the opportunity to volunteer and intern with local community groups. Middle Tennessee State University, located in Murfreesboro, Tennessee, is the first choice of transfer students out of all Tennessee colleges. Undergraduate programs include horse science, fermentation science, apparel design, and physical education. The fermentation science program is the first and only degree of its type in the region. Classes for the degree are taught in partnership with local companies, including a brewing company started by an alumnus of MTSU. The university boasts more than 200 student organizations, including sororities and fraternities. MTSU is dedicated to helping military students and has the largest resource for military and veteran students in the state. The Charlie and Hazel Daniels Veterans and Military Family Center provides special services for student vets, and the Blue Raider American Veterans Organization is a place for vets to meet one another and socialize. Special services are also available to help women, LGBTQ, older, and non-traditional students. Run by the Southern Union Conference of Seventh-day Adventists, Southern Adventist University was the first Adventist school in the south and was founded in 1892. It is known for being conservative, and students must follow lifestyle policies such as not drinking, not wearing most jewelry, and observing the Sabbath. SAU is accredited by the Commission on Colleges of the Southern Association of Colleges and Schools and is one of the top colleges in Tennessee. SAU's most popular bachelor's programs are biomedical and biological sciences, but the school offers students a selection of many other undergraduate programs. Computing, chemistry, English, history, and journalism are some of the bachelor's degrees available. SAU's School of Nursing is also very popular. There are no sororities or fraternities, but there are numerous student clubs on campus. Located on the Southern Adventist campus is the McKee Foods headquarters, which provides jobs to many students. Founded in 1871, Christian Brothers University is a private Catholic university that ranks among the top Tennessee colleges. Students of all faiths are welcome to study at CBU, and bachelor's programs encompass the arts, business, engineering, and the sciences. Popular degrees include education, psychology, engineering, nursing, and business administration. Located near downtown Memphis, CBU is the oldest college in Memphis. The university is certified as a VETS campus, a Tennessee program recognizing campuses that meet requirements to help veteran students do well in school, including offering special orientations, mentoring, and support programs. CBU's study abroad program offers students the chance to study in countries around the world, including Spain, Australia, China, Italy, and France. Affiliated with the United Methodist Church, TWU is one of the smaller schools in Tennessee. The school educates around 1,100 students from its main campus in Athens and an extension center in Knoxville. The student-to-faculty ratio of 12:1 ensures that all students receive personalized faculty attention. TWU's academic programs include popular subjects such as business, communications, education, engineering, fine arts, and social sciences. The school also offers interdisciplinary programs that allow candidates to combine multiple academic areas. The college is a strong proponent of experiential learning. Many students participate in hands-on internships, study abroad programs, and service learning activities. TWU's 42-acre campus is home to a wide variety of activities and clubs, including student government, academic honor societies, interest groups, religious organizations, performance groups, and sororities. The school is also a member of the NAIA's Division II Appalachian Athletic Conference. The school is home to many athletic teams, including football, basketball, soccer, and tennis. Founded in 1867, this Presbyterian college in Tennessee strives to create an academically challenging setting for its students that integrates Christian faith with scholarship. King University, which was King College until 2013, offers dozens of undergraduate majors, including security and intelligence studies, youth ministry, neuroscience, and theatre. They also offer several online bachelor's degrees and a dual enrollment program that allows high school students to take college classes. Located in Bristol, Tennessee, the "birthplace of country music", King University is situated on 135 acres in the Tri-Cities area. Students have access to the attractions of city life -- rock concerts, the ballet, and specialty coffee shops -- and the Smoky Mountains foothills. Students can get involved on campus through 25 varsity teams that are members of the NCAA Division II and Conference Carolinas, or they can participate in one of the many events organized on campus by the Student Life Activities Committee at King. Part of the U of T system, the University of Tennessee-Chattanooga is one of the best colleges in Tennessee. UTC prioritizes experiential learning for its students, partnering with local community groups and businesses so that students can combine real-world experience with their studies. Undergraduate programs focus on helping students gain the skills needed for future careers and include majors such as chemistry, biology, criminal justice, geology, and legal assistant studies. Students can also choose from dozens of minors. UTC is accredited by the Southern Association of Colleges and Schools Commission on Colleges. UTC students can explore Chattanooga, a Tennessee city that has experienced recent revitalization and boasts shopping, dining, natural beauty, and industry. UTC students can join more than 120 registered student organizations, from the American Marketing Association's student chapter to a 3D printing club. The campus recreation department organizes opportunities for students to take advantage of recreational opportunities on campus and in the greater Chattanooga area. Founded in 1918, Lee University is located in the Appalachian foothills of Cleveland, Tennessee, and began as a small bible institute. Though sponsored by the Church of God, admission to the university is not determined by a prospective student's faith or religion. This Christian Tennessee college provides liberal arts and pre-professional educations that are designed to prepare students to live in a complex world as responsible Christians. Students can choose from nearly 50 undergraduate majors, including music performance studies, digital media studies with a cinema emphasis, an interdisciplinary studies program, and discipleship ministry. Degree requirements vary depending on what department a student is enrolled in, but every student must complete the general education core, which places a heavy emphasis on faith and service learning. With a 17:1 student-to-faculty ratio, and a liberal arts tradition, students receive the personal attention they need in order to find success in their programs. About 5,000 students attend Lee each year, coming from 49 states and 54 different countries. A sense of community is built at Lee through the more than 100 student clubs and organizations, and the athletic teams are members of the NCAA Division II. Tennessee offers an abundance of two-year programs in specialties like business and technology. Governed by the Board of Regents system, the Tennessee Colleges of Applied Technology make up the largest community college network in the state, comprising 28 campus locations and providing professional skills for over 50 unique technical occupations. Additionally, community college programs offered at other state facilities incorporate healthcare services and liberal arts disciplines. Whatever the concentration, two-year schools in Tennessee can provide accelerated options for career-oriented freshmen and adult professionals, alike. Tennesseans who have graduated from community college tend to earn a higher salary than those with only a high school diploma. Manufacturing, energy and healthcare are among the state's most lucrative industries; two-year college programs focus on the skill sets needed to excel in these and other sectors of the local workforce. If you're interested in learning more about how to pursue a two-year program here, start with our list of the top schools in Tennessee. Tennessee College offers several programs with emphasis in labor-based work. Students can earn an associate degree in collision repair technology, welding, administrative office technology, and more. In the past year, TCAT has seen 146 graduates, with 89% of them gaining employment in their field. TCAT proudly supports SkillsUSA, a program designed with the intent of turning ambitious students into quality leaders in labor-based industries. SkillsUSA is a foundation found nationwide and offered only by select schools. This college allows dual enrollment for high school students looking to earn college-level credits. You are given the option to submit qualified high school classes for credit at TCAT. Before enrolling at this school, you are encouraged to schedule a tour with an on-campus guide to determine what programs fit your interests. TCAT is among Tennessee community colleges to offer an administrative office technology program online. JAGC was founded in 1946 as one of the first co-educational and integrated schools of higher education in the United States, and was labeled as a nonprofit institution in 1965. Students can choose between three academic options: associate of applied science in funeral service, an associate of arts in funeral service, or a certification in funeral direction. Earning your AA or AS requires 16 months of study; the certification can be earned in 8-12 months. JAGC is accredited by the Southern Association of Colleges and Schools Commission and the American Board of Funeral Service Education. As a conservative institution, you will be expected to maintain a code of dress and conduct, the specifics of which are detailed on the school’s website. This school offers a number of financial aid opportunities ranging from FAFSA programs to independent scholarship programs. JAGC is one of the best community colleges in Tennessee for funeral services programs. Moore Tech, one of the best technology school in Tennessee, was founded in 1909. It’s one of the U.S.’s oldest vocational schools. Degree options include plumbing, maintenance technology, welding, and industrial electricity/plant maintenance. The school has a 95% employment rate post-graduation. Students can expect approximately 65% of their tuition and material costs to be covered. This school is a private, nonprofit institution primarily funded by a long-standing board of trustees. This board was gathered by the school’s founder: William R. Moore. After growing up in extreme poverty, Moore envisioned an institution of higher education that was accessible to the poor. To enroll, you must have obtained your high school diploma or a GED. The school recently announced they’ll be offering Pell grants to high school students. MSCC is located in 11 counties, including Bedford, Cannon, Coffee, and Lincoln. Motlow State offers over 40 degrees in business, career readiness, education, humanities, language, mathematics, and more. MSCC’s nursing program consistently exceeds NCLEX pass rates at the state and national level. Motlow is among Tennessee community colleges to offer financial aid and scholarships to qualified students. High schoolers can enroll as part-time students to earn college credits. In some cases, students can transform high school coursework into college credit. Athletics make up a large portion of MSCC’s campus life; soccer, men’s and women’s basketball, baseball, and softball are offered. Student clubs and organizations include Arts and Animation Club, Chess Club, Baptist Collegiate Ministries, and the Student Government Association. Student services include an online typing tutor, a writing center, and math tutoring. At RCNC you can earn a diploma, associate degree, or bachelor’s degree; each of these choices offer programs in healthcare, business, cosmetology, information technology, criminal justice, and more. Remington is among Tennessee community colleges to offer online courses and programs in health information technologies, paralegal studies, occupational therapy assistant, and others. The school has campus’ throughout the Southeastern U.S., from Ohio to Florida. RCN offers Active-Duty Tuition Assistance and Yellow Ribbon benefits for Vets. RCN guarantees its students that if they are continuously enrolled, their tuition will not increase throughout the program. This school also offers financial aid, loans, and scholarships. Diploma programs include medical assisting, cosmetology, dental assisting, and pharmacy tech. Remington’s career services offers help with employment applications and resumes, assistance with professional development (like interviewing skills), and finding potential employers. Walters State, one of the best community colleges in Tennessee, emphasizes student life, with 40 student clubs and six nationally competitive, intercollegiate sports teams. The school offers over 150 Associate’s degrees and Technical Certifications in five areas of concentration: the arts, fine arts, science, teaching, and general education. Walters State has an enrollment of about 10,000 students. WSCC offers a number of programs online, including criminal justice and early childhood education. Free advising, counseling, and tutoring services are available on-campus. WSCC offers several financial aid programs including loans, merit-based scholarships, and work-study positions. Online courses are offered through eLearn. Global Connections at the college provide students with international learning events, including showings of foreign documentaries and the International Festival every October. RSCC, one of the best community colleges in Tennessee, offers associate degree programs, certificates, and transfer preparation. Program options include business, economics, management, communications, and computer science. Dual enrollment is offered to high school students. RSCC is committed to making college more affordable with financial aid and need-based scholarships. Roane State has multiple campuses across Campbell, Cumberland, Fentress, Knox, Loudon, Morgan, and Scott counties. Students have access to free on-campus tutoring, counseling, and advising. RSCC takes an active role in your employment post-graduation by offering nationwide job placement services. The college has an active alumni community; graduates are encouraged to join the alumni association. Roane State has online degrees and courses and evening programs. Military students can earn credit for prior learning. The school has athletic programs in men’s and women’s basketball, baseball, and softball. Students receive access to the school’s fitness center. Northeast State offers degrees in fields including advanced technologies, behavioral and social sciences, business technologies, mathematics, and more. Students can participate in NSCC’s Cultural Activities Committee (CAC); it is the mission of this group to bring people of different backgrounds and experiences together in order to share their culture/worldview. The CAC hosts events such as theater and art exhibitions. Alumni are given access to an active alumni network and directory. Students are required to have their high school diploma or GED to attend; learners are given the opportunity to complete their High School Equivalency Diploma at NSCC. Student activities include performing and visual arts, intramural sports, skills competitions, and service. Northeast State is among community colleges in Tennessee to offer leadership programs. The school’s literary magazine, Echoes and Images, invites students to share their fiction, nonfiction, poetry, and visual arts. STCC, one of the best community colleges in Tennessee, is a public college that offers certificates and associate degrees. Many of the school’s degrees can be transferred to a four-year institution. Southwest Tennessee has degree programs available online and on weekends. Programs include allied health, automotive service, criminal justice, and biotechnology. STCC has an on-campus child care program; children are taught with an “open-education” mindset designed to encourage their independence and decision-making skills. The school has an active student network with extracurricular programs including student government, honor societies, and intramurals. Southwest Tennessee has athletic teams affiliated with the National Jr. College Athletic Association. Student clubs include The Baptist Student Union, The Hispanic/Latino Society, and the Medical Lab Technology Club. These clubs were founded with the intent of creating a campus community and furthering education through activities. Columbia State has over 50 majors offered in four academic divisions: health sciences, humanities/social sciences, technology, and mathematics. Around 10,000 students attend CSCC each year. Dual enrollment is available for high school students looking to earn college credits. CSCC has locations in Franklin, Lawrenceburg, Lewisburg, and Clifton. CSCC has an active campus life, offering clubs and organizations like Phi Theta Kappa (an internationally recognized society of honor’s education in community colleges), student government, and athletic teams. This school also integrates itself into the surrounding community with art exhibitions, volunteer opportunities, and more. The school hosts concerts, lectures, performances, and cultural events. Columbia State is among community colleges in Tennessee to offer study abroad opportunities in the United Kingdom, Brazil, Italy, Greece, India, China, and more. Workforce Development programs give local employers and employees the ability to improve and learn new skills. JSCC was founded in 1963 when the Tennessee General Assembly declared it necessary to have a related set of community colleges. Jackson State has campuses in 14 counties, including Jackson, Lexington, Humboldt, and more. To attend JSCC, you must have a high school diploma or GED; if you’re under 21, you will be required to provide ACT/SAT scores from within the last three-years. If you’re over 21, you will be asked to complete the COMPASS placement exam. This college offers degrees in applied technology, business, education, health interest, and STEM. Technical and academic certificates include EMT paramedic, general education, and phlebotomy. JSCC has a number of student-led clubs. The school is among Tennessee community colleges with an athletics department. Sports programs include men’s and women’s basketball, baseball, and softball. Volunteer State offers benefits to Veterans and active members including tuition assistance to the individual and their spouse. The school has no formal application deadline, but class enrollment is determined on a first-come-first-served basis. Non-credit classes are available for students enrolled in a four-year institution. In order to be considered a full-time student at VSCC, you must be enrolled in a minimum of 12 credits per semester. VSCC offers the “Tennessee Promise” program. This mentoring/scholarship program is unique among Tennessee community colleges and is awarded to students in need of financial assistance. The Tennessee Promise requires you to complete a minimum of eight-hours of community service prior to each semester, to be enrolled in at least 12 credits per semester, to check in with an assigned advisor throughout the program, and maintain a GPA of 2.0 or higher. In exchange, your tuition fees are waived. Academic programs at DSCC give you the opportunity to attain a certification or earn an associate degree. According to the Tennessee Board of Regents, in 2009 Dyersburg was named the fastest growing institution of higher education among Tennessee community colleges. The college has campuses in Dyersburg, Trenton, and Covington counties. Each campus offers free tutoring and counseling to students. DSCC has an active student life community with academic, entertainment-based, and cultural clubs and an active intramural program. Eligible students may apply for enrollment into the school’s Honors Program. DSCC offers study abroad programs. The school also offers scholarships for students who cannot afford the high cost of travel. Online, hybrid, and eCampus courses are offered. Nashville State Community College offers an array of programs through several campuses across the state. NSCC's more than 80 programs include an associate of applied science degree that immerses students in general education and professional or technical competencies. Areas of study include accounting, healthcare management, law enforcement, and paralegal studies. Students pursuing their technical AAS degree have several options, including surgical technology, industrial process control, computer information technology, and architectural engineering technology. NSCC's extensive catalog of transfer degrees makes it one of the top community colleges in Tennessee. Students can get a head start on their bachelor's degree by completing two-year degrees that are guaranteed to transfer to a Tennessee public college. The school offers transfer degrees in fields such as business administration, computer science, electrical engineering, and healthcare management. Students at NSCC enjoy comprehensive support services and affordable tuition. PSCC, one of the best community colleges in Tennessee, specializes in technology and engineering-based degree programs, but offers a variety of degrees in social sciences and the arts. Many degree programs are offered online or in a hybrid format. If you have job experience or took relevant classes in high school, you can take a Prior Learning Assessment to determine whether your pre-existing knowledge translates to college credit. PSCC provides service learning opportunities that allow you to become more involved in your community; service learning often serves as on-site job experience in a relevant field. PSCC offers an array of student-based, cultural and artistic programs. These programs and clubs are integrated into the community through open gallery exhibitions, theater events and performances, and cultural lectures/talks. Dual enrollment is offered for high school students. If you're thinking about applying to one of the best colleges in Tennessee, continuing reading to learn more about living in the Volunteer State. Tennessee is the 17th most populous state in the nation, and growing: the state has seen an influx of migrants from both northern and southern states in recent years, due to the appeal of Tennessee's low cost of living and booming industry jobs. Historically a hub for the development of popular American music as we know it today, cities like Memphis and Nashville are world-renowned for bringing Blues and Country to the masses. Legendary sites such as the Grand Ole Opry and Elvis' Graceland are among numerous tourist attractions in the state, which also draws fans of the warm, southern climate and uniquely varied terrain. In addition to several mountain ranges and coastal plains, Tennessee is home to more caves than any other U.S. state. Tennessee had a per-capita income of $25,227 per year as of the most recent 2016 data. In addition, 24.9% of Tennesseans 25 and older had a bachelor's degree or higher, slightly below the national average of 29.8%. 84.9% of residents age 25 and older had at least a high school diploma, also slightly under the national average of 86.3%. Tennesseans must prove residency to access in-state tuition prices at local public colleges. Students 18 or older must provide proof of state residency; minors must live in Tennessee with either a parent or legal guardian to qualify for reduced tuition. If a student is a minor at the time they enroll, they must prove that their guardians live permanently in Tennessee to claim residency themselves. Furthermore, establish residency in Tennessee, a minor must live with a parent or guardian in a household within state borders. If the parents are divorced or separated, the minor must reside with the parent living in Tennessee. Minors must also prove that they lived with their parent in Tennessee before turning 18 and that they intend to continue living with that parent until the beginning of the school year. You must physically reside in Tennessee for at least one year prior to declaring residence. You must prove intent to make Tennessee your home.